Hail friends of Greyhawk. You may or may not have already seen, but the newest issue of Dragon+ (a periodical I have slacked in reading) has a new article that is a must read. Behind the Screen: Greyhawk by John Roy and Luke Gygax is both a nostalgic ride to the early years of Greyhawk and D&D and also a quite thorough summary on the mood and themes of the setting for those thinking of running Greyhawk for the first time. It covers all the sources for 5th Edition or in classic books on DMsGuild, that one would need (up to and including the newest announced book, Ghosts of Saltmarsh) for a proper Greyhawk campaign. Kudos to John Roy for writing this piece! There is also a mention in the article of Luke Gygax's panel, Growing Up Gygax, at Gary Con XI in March. I will be there possibly because I'm also in a panel at the con, Celebrating Greyhawk: A Fandom Renaissance which is right AFTER Luke's. Come see me along with Anna Meyer, Bryan Blumklotz, Carlos Lising, Kristoph Nolan and Allan Grohe. 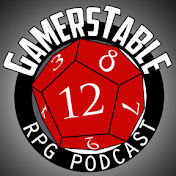 Hopefully we get some spill over from the Gygax panel to talk more Hawk! Greetings Greyhawk mavens! 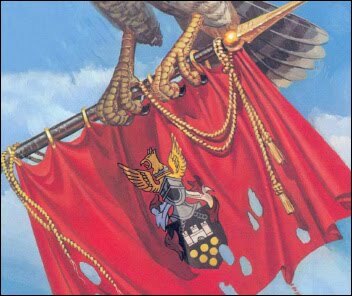 As we get closer to GaryCon again I am starting to feel anxious to talk Greyhawk. To pass the time, I started drawing mini-maps of sections of the Flanaess, with some clever artistic touches thrown in. I doubt I'll do a whole lot of these, but I'm looking for corners of the map that are often neglected, that might look more interesting if you have a magnifying glass put on them. This first map I'll show you, is just a straight hex for hex reproduction of the Darlene map of the Lordship of the Isles-Oljatt region. 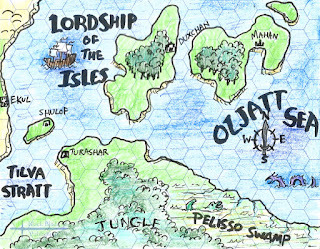 The map does not show all of the lordship though, as the archipelago continues northward including the capital Sulward. Nor does it give Hepmonaland much love. I wanted to draw attention to the isles and the Pelisso Swamp. The Lordship depending on what era you use, is an underused, underdeveloped area. In the pre-wars era it is a land of buccaneer explorers who flaunt the rule of the Great Kingdom and the Sea Barons. (my preferred era) Post-wars they are capitulating sea lords who serve as the defacto navy of the Scarlet Brotherhood. As you can see, within this small window there is a lot going on here. 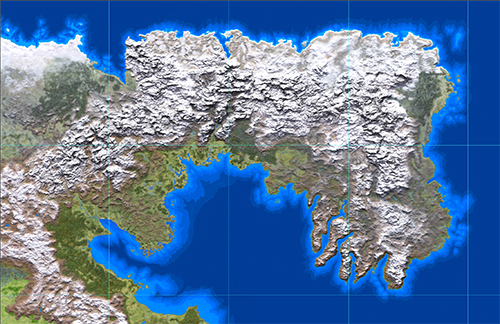 Complex coast lines, colonies, monsters, many ports of call. One of my dreams is to set a campaign here to compliment my Hold of the Sea Princes high seas adventures. 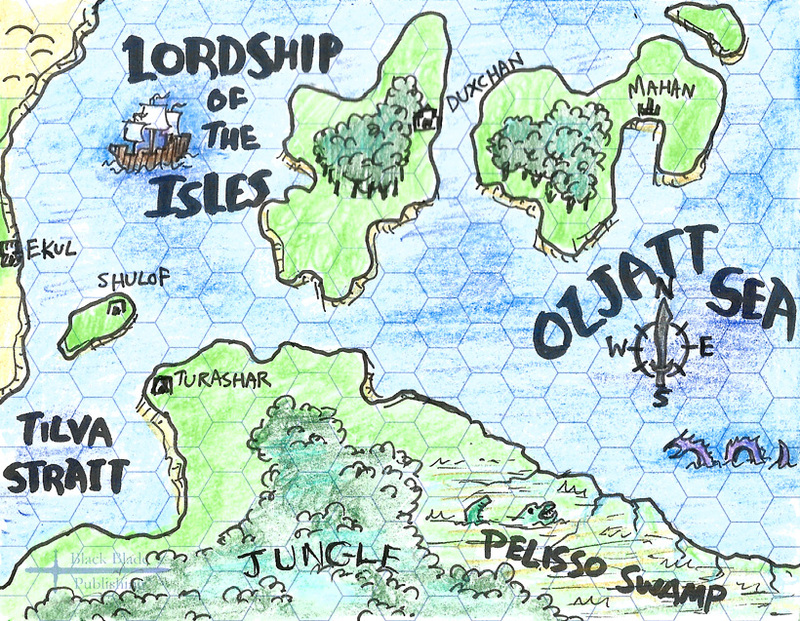 The Living Greyhawk Gazetteer has a bit of good info on the Lordship, but the isles as well as the surrounding coasts is really untamed territory for DMs in my opinion. Enjoy! p.s. This map was made using hex paper provided by Black Blade Publishing. 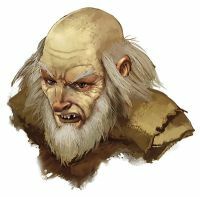 City of Greyhawk: The Gem of the Flanaess is neutral and wealthy, perhaps supported by a robust system of taxation managed by of course, the dwarven head of the Greyhawk Revenue Service, Glodreddi Bakkanin. Visiting the city, one might be hit with a Ship Tax (3sp to 5gp), a Cargo Tax on imports (up to 1%), a Precious Metal Tax (1%), except for Urnst platinum (.5%). There is also a Freesword Tax (3gp) annually, and a Guild Tax (5sp to 5gp) annually. Glodreddi is always looking for new tax schemes and is also responsible for the People's Constables whose only job is to write citations for crimes so petty they are essentially tax collectors in disguise. Furyondy: Think it would be nice to live in the good Kingdom of Furyondy? Think again, this place is in perpetual war with Iuz and has to maintain its existence through taxation. Chancellor Rayman Delbeith oversees the collection of funds for his king. The king can collect tithes and taxes due to a Nobility Tax and a Land Tax since all the nobility are technically only leasing their homes and titles from him. This is a low tax and cannot be raised without a vote of the provinces. There is also a Capital Tax created to help rebuild Chendl during the wars. In turn the provincial rulers tax their retainers and subjects. Nobility Taxes on knights (10-50gp and up to 1000gp for a Count) annually. Hearth Taxes are imposed for luxury items like stone fireplaces (3-20gp) per year. Furyondy rulers collect taxes many other things in this hard time. Harbor Tax on ships (10sp to 4gp) per day, tolls on roads and fivers (1cp to 5sp), Magic Item Tax (2-30gp) per year, Freesword Tax (1gp) per quarter, Foreign Resident Tax (2sp to 20gp) per year, Inheritance Tax (5-30%), Luxury Tax (5-25%) and then there is Tithes on goods produced usually starting at 15% multiplied by each provinces' rate. Speaking of these rates, The Marklands source book shows each provinces' multiplier for these base Chendl taxes and services. So for example, the Barony of Kalinstren is x1.6 base costs and County of Crystalreach is x1.7 whereas Duchy of the Reach is only x.8 and Gold County is x.75 the base. Nyrond: So Furyondy isn't the only large kingdom who will tax you to death. Nyrond is just as cash strapped. You can expect to use all the same taxes as Furyondy plus it has novelty ideas like Fencepost Tax (1cp) per per post! There is also a Boot Tax (3sp) annually for every pair of foot wear you own. Not surprisingly tax evasion is rife in the Nyrond. Great Kingdom: This huge land once stretched across the Flanaess but is now fractured, but still very large and powerful. Here, the populace of Aerdy also face similar taxes outlined above, but here it can be much higher. In addition the Overking has implemented special taxes like a Castle Tax to help build more keeps and castles in the kingdom and a Worship Tax to harass good religions. Keoland: Not to be left out, the Kingdom of Keoland to the southwest is currently in a less desperate period of time than its peers, if one discounts the Giant Troubles and high seas piracy. A DM can expect this medieval kingdom to excise the same sort of taxes mentioned earlier, but at an average to lower rate depending on your campaign. Interestingly, the king here cannot create new taxes, only the Council of Niole Dra may do this. That's all for now. You can imagine from the above examples how taxation in the World of Greyhawk can become a facet of concern for players and a reason to find more treasure, or perhaps even a reason to smuggle in their hard earned loot. Wherever the PCs decide to reside, be it Ket, Veluna, Irongate or even the land of Iuz, a tax collector will always be lurking in wait to pay a visit. Iggwilv and Graz'zt: Aww yes, you knew I would mention this couple (well off and on). They are the best confrontational pair in the entire setting. Iggy and Graz' even have a child together (spoiled demigod Iuz, such a dysfunctional family). Iggwilv is an aspiring demonologist-witch queen-conqueror. Graz'zt is an aspiring Prince of Demons-would-be conqueror of the Abyss. Clearly the pair's egos are not big enough to fit on one infinite plane. There is a lot of good game info on this diabolical couple I don't have the room to tell it all! Want to know EVERYTHING about Iggwilv though? Check out this amazing post on Power Score. Cobb Darg and Elayne Mystica: I'm not sure if these two are a romantic pair, but they should be! Cobb is the old wily ruler of Irongate and Elayne is the albino Suel archmage of the same city. There has got to be a spark there, and I'm certain she knows Mayor Darg's secret heritage. Queen Yolande and (various) Consorts: Elven culture might be different than human-kind in regards to courtly romance since they live so long and are many times xenophobic. Queen Yolande of Celene has had many consorts over the centuries, and the murder of one even started the Hateful Wars that drove all humanoids out of the Lortmil Mountains. I'm sure Yolande has moved on by now, though given her isolationist stand, does she ever look outside Celene for companionship? Karin Keoffel and Yrag: I'm willing to bet you don't know who is Karin Keoffel. She happens to run the Fruit of the Mill in the lower part of Greyhawk, she is 44 years old and is cheerfully in love with her mercenary boyfriend "Yr". Whether she knows Yr is actually Yrag, a magically preserved 200 year-old adventuring legend is not known. What is for sure is that Yr/Yrag definitely loves his girlfriend and has gone to lengths to discreetly protect her, such as gifting magic items and telling the Guild of Thieves to back off her business. If that isn't love I don't know what is! Iuz and Zuggtmoy: Iuz has many henchmen and allies he could choose as his consort, but in Greyhawk lore (and novels? ), the Lord of Pain for some reason has an infatuation with Zuggtmoy the Demon-queen of Fungi. Despite being a power-couple they both have spent time in prisons, so their relationship has always been strained. Despite this I suspect Iuz loves her more than she loves him back. So much so, that Iuz literally gave Zuggtmoy his soul to guard on her abyssal plane. Like that won't ever come back to haunt him some day! Lady Evaleigh and Gord or Alain IV of Ratik: The comely Evaleigh is a noblewoman from the County of Knurl and was featured as a love interest to Gord the Rogue in Gygax's early TSR novels. How that turned out, I'm not 100% certain, since I never read them all. Evaleigh however did make into the game setting as the widowed ruler of Ratik. She married the son of Baron Lexnol, Alain IV and he was soon killed by gnolls. Evaleigh had to assume rulership after Lexnol then became disabled upon hearing the news. Tragedy! Wee Jas and Norebo: I would be remiss if I didn't mention this dynamic Greyhawk deity couple! Wee Jas the goddess of death and magic could only be won over by the roguish charm of Norebo right? After all he has been reputedly with every female deity it is said. Unfortunately, being gods of the Suel Pantheon, there's a good chance they are related! Why she puts up with him and his cheating ways in the first place is a matter of theological study. I know cause I've done plenty myself! Dragotha and Tiamat: Draconic love. Till death do they part? Lorana Kath and Lord Kargoth: Both death knights of the Great Kingdom. A couple that works together! 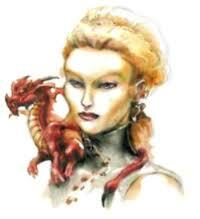 Markessa and Markessa: This Slave Lord likes altering the minds and bodies of elven women into doubles of herself. Self-love? That's all for now. What other great Greyhawk NPC relationships are there?